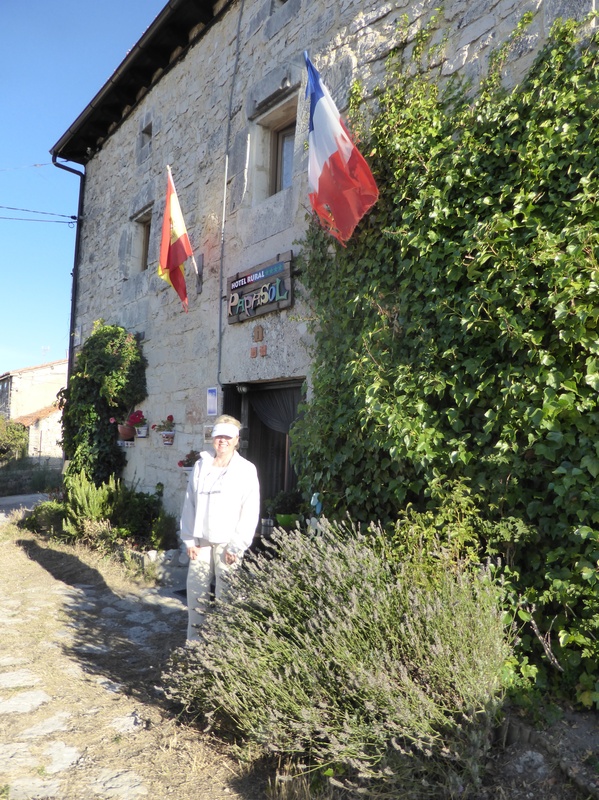 Our funny little hotel in Atapuerca, population 202.Most houses have to be 2-300 years old. This was the scene earlier this evening – what seemed to be a calm Friday evening in downtown Burgos. By early evening the streets were filled, we mean packed. with Spaniards of all ages walking the streets… it seems a routine thing to be on the streets of the inner towns till late at night. Lots of street noise, competing recorded music blaring from almost adjacent storefronts and children yelling. As I type it is after11 pm and it is still very noisy, complete with young children who do not seem to have bedtimes! This is the labyrinth or as some other pilgrims called it a “Prayer Circle”. Many years ago it was started with a cairn and a few stones leading out starting a circle of stones around the cairn. 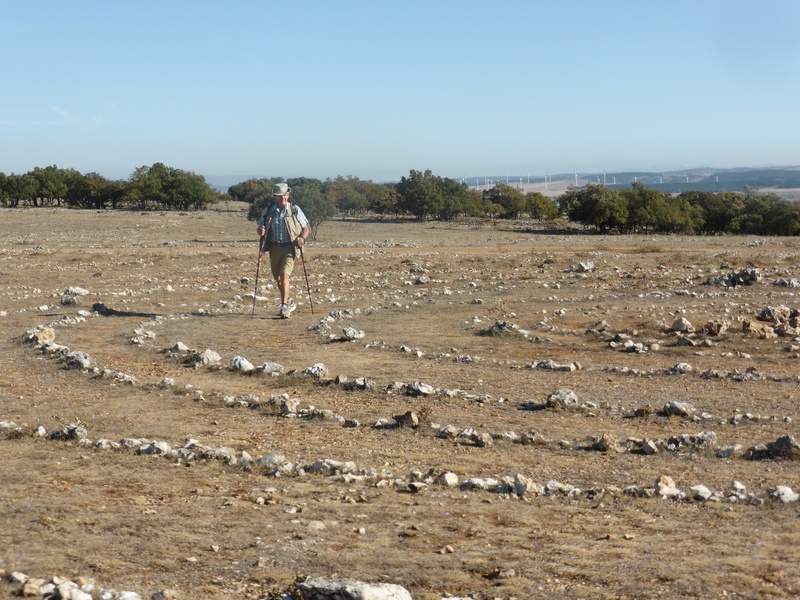 Over time the trail of stones formed concentric circles with each circular trail about 2 feet further from the center. Didn’t count but I would estimate that there were over 20 circles of stones. Here Mutti adds a stone for each of our families. Dad spent a few moments walking a few of the inner circles, he felt it very moving to think of the thoughts and situations behind the stones placed so long ago. The steep climb to the top of the Matagrande ridge was a bit of a challenge. A couple of kms of rough going, great for goats. Despite the creaking floors, clunking doors and Spanish bed pillows (we will include a photo), we had a good sleep. Our early peregrinos driven by 1. avoiding the heat of the day 2. needing to get to an albergue in time to get a spot, are up before dawn, head lights on and gone. Everyone was very considerate about being as quiet as possible when leaving—kind of them. We actually had the breakfast room all to ourselves:-) We will soon be known on the way as “the lazy peregrinos”. Our walk began a bit chilly as we had a head wind coming from the north. It was very comfortable especially as once again we began climbing and quickly warmed up. Unless you look very carefully at your map, you do not see that this land is crossed with river valleys and small mountains. 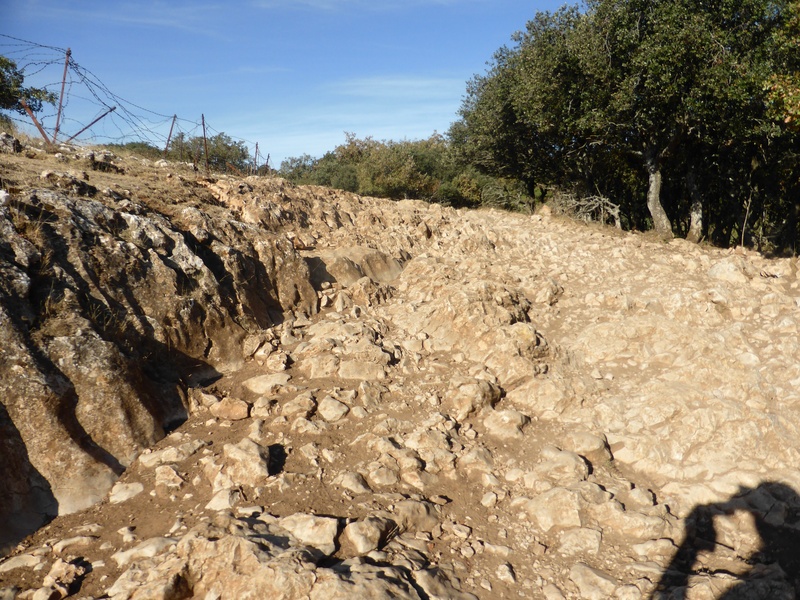 Thank heavens, the meseta is just over one of these “hills”! There was an infinity labyrinth once we reached the top. 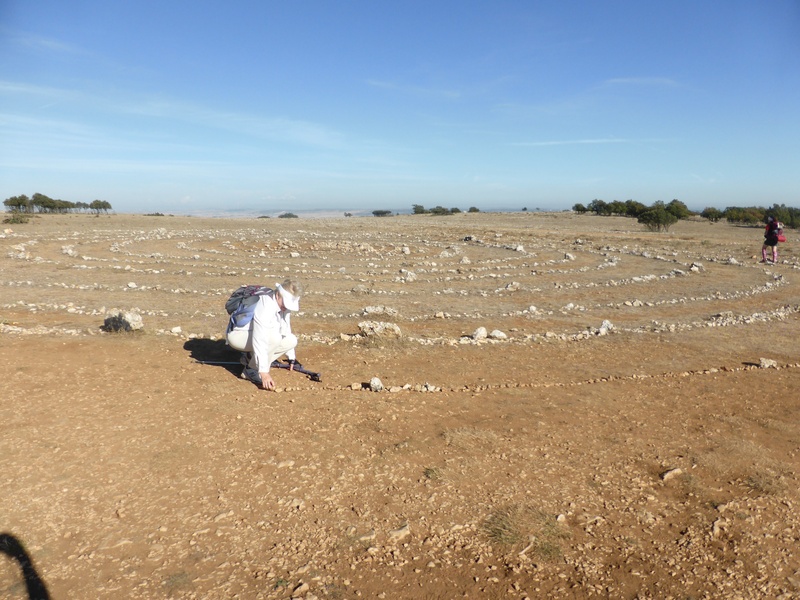 This has been built out of rocks by peregrinos and each pilgrim passing is to walk the labyrinth and add to it….so we did. Enroute we walked portions with a nun from Slovenia, women from Sweden and Italy, and a sweet couple from New Jersey. He is a young pastor and she has just finished divinity college. 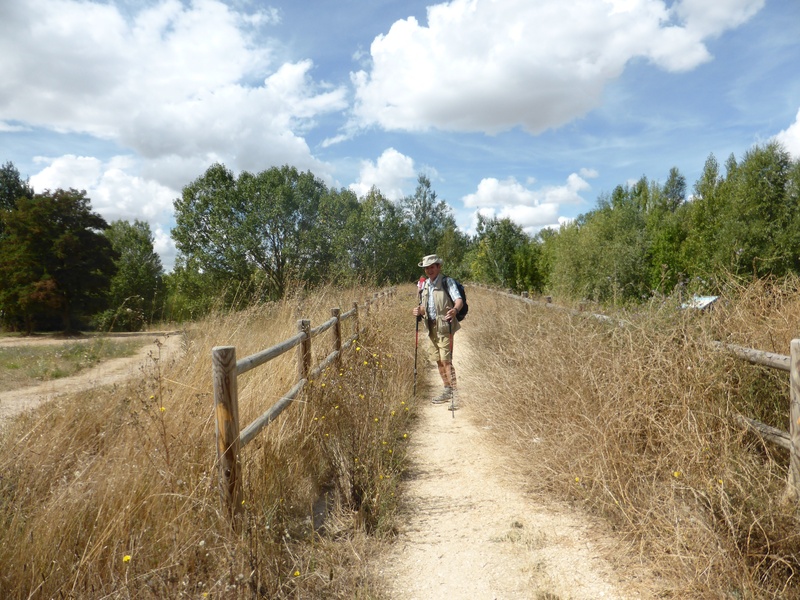 There are two routes leading to Burgos—one through the industrial area and the less travelled one through a nature preserve. We chose the less travelled and discovered it was also less marked. Dad and his GPS app kept us on track. 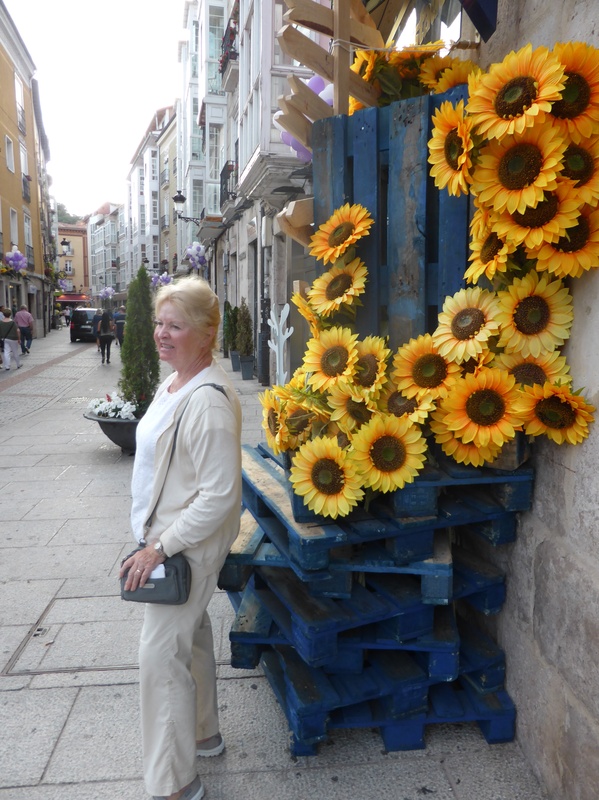 Once again our hotel is by the church and the plaza under our window is festive tonight:-) It is decorated with balloons and sun flowers, a crowd is milling about, there are competing musicians, and earlier fireworks. We are beginning to think this is just how Friday is celebrated in Spain.